Moving to a new Country for Study? International Student and Faculty medical coverage for U.S. Inbound or Outbound (High School, Jr. College and University), J-1 and F-1 Visa eligible policies. Comprehensive Global medical insurance cover for the student studying outside of their home country, along with access to qualified physicians and hospitals in over 180 countries. Protect yourself against unforeseen accidents and illnesses. International Medical coverage for the global student and faculty. U.S. student and foreign students studying and living anywhere in the world. This is very important coverage and should be included in all international plans! Domestic health insurance and workers compensation does not provide coverage for emergency air evacuations. Customer Services Centers with multi-language assistance and support. A Medical network consisting of over 1 million partnerships, including 89,000 behavioral health care professionals, and 11,400 facilities and clinics. A simple claims system that enables you to access treatment without paying in many cases, simply be calling our Customer Care Team first. Paying your Premiums … You can choose to pay for your premiums on a monthly, quarterly or annual basis. You can make payments by debit or credit card, or alternatively in you pay annually, you can pay by bank wire transfer. Please let us know if your credit card has expired or if you get a new credit card so that we can update your card number and expiration date. Renewing your Policy … We will contact you at least one calendar month prior to the end of your period of cover to see whether you want to renew your policy. We will inform you of any changes (if any) to your benefits and policy terms and conditions which will apply on renewal. your policy documentation for the forthcoming period of cover will be available in your secure online Customer Area, including your schedule of insurance which details your premium. If you have chosen to receive printed copies of your policy documents, we will send them to the postal address you gave us. If you decide to renew, you don’t need to do anything, and your policy will be renewed automatically for another 12 months. We will issue a Certificate of insurance for your new period of cover on your annual renewal date. Our wide range of deductible and cost share options allow you to tailor your plan to suit your needs. You can choose to have a deductible and or cost share on the Cigna international Medical Insurance and or international Outpatient options. No deductible applies to inpatient cash benefits or newborn care benefits. You will be responsible for paying the amount of any deductible and cost share directly to the hospital, clinic or medical practitioner. Cigna Global will let you know what this amount is, if you select both a deductible and cost share, the amount you will need to pay due to the deductible is calculated before the amount you will need to pay due to the cost share. The out of pocket maximum is the maximum amount of cost share any beneficiary would have to pay per period of cover. International Medical Insurance is your essential cover for inpatient, day-patient and accommodation costs, as well as cover for cancer, mental health care and much more. Our policies travel with you wherever you may be worldwide. Seniors who travel, vacation, work or live abroad need to be aware that Medicare does not provide any coverage once you leave the U.S. Senior Travel Insurance pays for the unexpected illness or accident costs. Medicare Supplement plans along with Medicare Advantage coverage typically offers very little and often no coverage as well outside our borders. You need to be very careful while on vacation, even if it’s a quick trip. Many accidents or illnesses will not be covered while abroad. If you need medical attention you will typically be asked for a credit card to pay for the services. Medical facilities will not accept and do not know who Anthem, Mutual of Omaha or Aetna is. Your ID card means nothing to them. They all know visa and mastercard. When you return to the States, you will need to send your insurance company any receipts you have which shows the medical services you paid for. In each situation the insurance company will determine if each service is considered an “emergency situation.” Which they will pay a portion of. If the service you received is not considered an “emergency” you will not be reimbursed. On a Cruise .. I’ve heard of too many occurrences where a person becomes gravely ill, and the boat authorities inform the individual, the boat is not properly equipped to care for your health needs and that you will need to embark on the next island. An ambulance is waiting to take you to the nearest medical facility. In this situation you have lost all control of your situation and are relying on local authorities and medical services to help you. With a GeoBlue Travel Insurance policy, with one call you will be assured a team of professionals are working to quickly coordinate the best available medical care for you regardless of where are worldwide. Whether at the local island or if you will be emergency evacuated to a new location which can properly care for your current needs. GeoBlue is available 24/7 to help you nevagate the complicated global health care situation wherever you may be. Trip-Insurance – A plan with medical coverage for illness and accident along with reimbursement for costs such as longs or damaged luggage, missed flights or tours because of late connections. Cancelled excursions, or cancelled trip because of unforeseen situations such as; illness or injury before your leave on your trip. Info. Long Term – 6 months or longer, including permanent plans: Global families, Expatriates, Multinational Executives and Employees on foreign assignment. Short-Term few days up to 6 months. Vacations, business trips, etc. Students International Students & Faculty – Inbound or Outbound (F-1 & J-1 Visa). Vacation Insurance Trip cancellation, trip delay, lost/damaged luggage, Medical coverage. Medical Emergency Abroad … If you are experiencing a medical emergency abroad and need air transport, with one call, your GeoBlue team of experts will coordinate and arrange all of your transportation needs. With only domestic health insurance or Medicare you will be responsible for arranging everything from a emergency ground transportation, discharge and paying the local hospital so air evacuation services can transfer you to adequate facilities. Transportation may require medical personnel to accompany you to a different hospital facility, or back to your home country. To protect against unforeseen events that could result in long-term financial hardship, GeoBlue has established a medical travel insurance program to fit the needs of travelers worldwide. Many people falsely believe that their existing American health insurance or Medicare policy will cover them when abroad. This is not usually the case. Confirm what coverage, if any, your current insurer provides. Likewise for a person coming to America from another country, in most situations you will need an International/Travel health policy in place when you arrive to the U.S. Employee Group International coverage when traveling, working and living abroad. When your employees are working and living abroad, you have a basic responsibility for their safety and well-being. Depending on the destination, an employee on assignment might be facing serious health, safety and security risks while employed abroad. Some assignments may place the employee in higher risk areas. Higher risks for infectious disease, work site and occupational risks, political and terrorism risks, lack of quality medical facilities and access to medications. “Hot Zones” or high risk area’s the employer and employee must also be aware higher incidents of terrorism, kidnapping, war and attacks. Short-Term – Global employee trips less than 6 months. Long-Term Employees working and living abroad for 6 months and longer. Employees, Independent Contractors, Third Country Nationals. Group International Health Insurance for the Global Employee … A quality International Health insurance policy can go a long way in helping assist the employee and family members with their medical, health and safety issues while abroad, including emergency medical evacuation and repatriation benefits. Some international insurers including Cigna and GeoBlue pay their contracted doctors direct so the employee doesn’t have to pay themselves until reimbursed by their company or insurer, which can take several weeks or months. Your domestic U.S. health insurance card is typically a useless piece of plastic while seeking care abroad. Without International health insurance you will need to pay the hospital and doctors on the spot before being treated. If you have Medicare, you effectively have no insurance outside the U.S. Medicare provides no coverage outside the United States and it’s territories. An Insurers “mobile app” can be a tremendous tool while away living and working abroad. It travels with you on your smart phone or tablet. Find english speaking doctors in your area, search for contracted providers and see where they attended medical school. Schedule appointments and email your ID card. Locate pharmacies and fill prescriptions, and much more. Receive travel alerts; civil unrest, war and terror alerts. Infectious disease concerns, what immunizations you will need before travel, and have 24/7 access to a team of professionals ready to help you with your health, travel and emergency concerns. HR and Benefit professionals understand the risks involved with sending an employee and family abroad on a foreign work assignment. So providing your worker with the best available tools while away will help the employees peace of mind, knowing they will be provided excellent medical insurance coverage, access to quality medical professionals, help with foreign medical laws and systems and help, advice and coordination when emergencies strike. International Employees who travel to several global locations can enjoy have one international medical policy to take with them regardless of where they are in the world. GeoBlue members use their mobile devices to access an exclusive level of care. The GeoBlue mobile app provides the most convenient access to the best doctors, hospitals and resources around the world. Using the app, members can do anything from finding emergency services, to translating symptoms, to finding the right doctor at home or abroad. With a few simple taps, members get detailed profiles of carefully selected primary care physicians and specialists, as well as a broad range of hospitals, pharmacies, even dentists and can then review qualifications, make an appointment, and get directions. 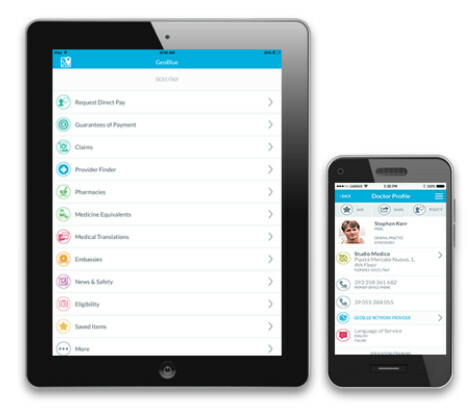 Plus, proof of coverage is always at their fingertips, ready to show and share with providers. GeoBlue and Cigna Global have elite networks of doctors from almost every specialty ready to see you in over 190 countries. Only a small fraction of doctors around the world meet GeoBlue’s exacting standards-participation is by invitation only. We seek out professionals certified by the American or Royal Board of Medical Specialties who speak English, and we factor in recommendations by over 140 Physician Advisors from all over the world. We assemble in-depth provider profiles so our members can choose with confidence, and we put formal contracts in place to ensure preferred patient access. GeoBlue doctors and hospitals bill us directly so members don’t have to worry about filing a claim. Members covered by a GeoBlue plan that offers benefits in the United States have access to the largest national network of providers and facilities; more than 92 percent of physicians and 96 percent of hospitals contract directly with Blue Cross and Blue Shield Plans. The GeoBlue Xplorer Essential plan (NO U.S. Coverage) covers most services outside the United States at 100%. All plans have an unlimited lifetime maximum and a $250,000 maximum benefit for emergency medical evacuation. Choose this plan option if you do NOT need U.S. coverage included. Worldwide coverage, excluding U.S. offers a 50% savings. Deductible choices from $0 – $10,000. Choose provider either in or out of the GeoBlue elite Network. No waiting period or sub-limit for preventive services. Pre-existing conditions covered with credible coverage. Illnesses and injuries related to terrorism. Can be use on its own or with a domestic health plan. If you need U.S. coverage included in the International Medical policy. The GeoBlue Xplorer Premier plan (includes cover in the U.S.) has three tiers of coinsurance: 100% outside the U.S.; 80% in-network inside the U.S.’ 60% out-of-network inside the U.S. All plans have an unlimited maximum and a $250,000 maximum benefit for emergency medical evacuation. The Out-of-pocket Maximum is calculated by adding the deductible and coinsurance maximum together. Worldwide coverage, including the United States. Deductible choices from $0 – $5,000. No pre-certification penalty for inpatient or outpatient care. Can be kept upon return home, offering unique portability. A medical emergency strikes … you’re working, studying or living abroad, you don’t speak the language. What do you do, who do you call, where do you go? Can you contact with your domestic carrier? If so, will they tell you where the nearest modernized medical facility or hospital is in; Asia, Africa, Europe, Australia or any other part of the world? If the nearest medical facility is unacceptable will they Med-evac you to an appropriate medical facility. Will they coordinate care for you, use translators or approve a surgery on your behalf? NO they can’t, and no they won’t. What if it’s after hours or on the weekend, maybe it’s an extended holiday? Will they even except your call … What now? Don’t be stranded by your domestic health insurance carrier. They may be a quality health insurance provider here in the states, but once you cross the border, they are simply not equipped to do what is needed. International Health Insurance companies like GeoBlue Worldwide specialize in this very diverse, global medical environment. They are experts in navigating the global medical landscape. They understand and are prepared to work with the hundreds of medical systems and languages currently in place around the globe. Individual Plan or Group Plan? Many employees, contractors, third country nationals, choose to enroll in “individual” policies instead of setting up a “group” plan for a business. If the company need coverage for 5 or 10 employees in the same location or spread out abroad, individual plans work great. The coverage between an Individual policy and Group policy are very similar. The primary difference is the “individual” policy requires limited medical underwriting, which means the person applying for coverage must be approved medically. Group plans do not require a health screening to be approved. If the company has, for example more than 15 employees, a group plan may be the best option, since the medical screening will not hold up enrollment. Feel free to call me with your situation and I can help with a few suggestions. Having joined the millions of others around the world who’ve taken the huge step in life to relocate to a new country, it’s important to secure peace of mind in as many aspects of your new life as possible. We specialize in health insurance policies for expats just like you, ensuring you have the very best of care available to you as and when you need it. professionals worldwide. With Cigna, you can create the policy that’s right for you and your family. We offer three distinct levels of cover, with a host of optional additional benefits. Read on to find out more about what we have to offer. Don’t take any chance when working, living, studying or traveling abroad. If an illness or accident strikes, an International Health insurance policy from GeoBlue or Cigna Global will help and protect you and your family from the unexpected. Feel free to contact me anytime with questions? Silicon Valley employees, independent contractors, third country nationals and global families all need international medical insurance protection from accidents and illnesses which occur abroad. Silicon Valley companies who send their employees abroad on long-term and short-term assignments can be covered by either a Group International plan or single Individual international medical plans. Both offer similar coverage, although the group plan will offer guaranteed enrollment regardless of the employees current or previous health status. Individual international medical plans, at least the “good ones,” will have limited medical underwriting which need approval before the policy is either approved or denied. When are “Individual” International medical policies chosen? Usually when there are a few employees and or families needing coverage. More than 5 or 6 employees or contractors, the employer will typically opt for a group international medical plan. Group Plans are very easy to start and have very limited administration. Also, group plans can include independent contractors and third country nationals who are not necessarily on your payroll. You do not need proof of employment through payroll records. Silicon Valley’s tech, medical and pharmaceutical industries are all very involved with providing international medical insurance to their employees and contractors on a short-term and long-term basis. Start-ups with only a few employees up to multinational corporations with hundreds, take advantage of the available international coverage options regardless of where you are and for how long. No matter what you choose, your globally mobile employees will be covered virtually wherever they go, even if they are relocated. And to make the return home less stressful – for you and them – they’ll have a period of time where their Cigna Global plan covers them at home. Oil and Gas employees, independent contractors, third country nationals and executives all need International Medical insurance while working and living in Latin America. In the event of an accident or illness while on the job or off, your International Medical plan is designed to pay so you don’t have to. Hospital, outpatient, lab & X-ray, emergency evacuation, Rx, surgery, Dr. visits and much more. Plus access to quality english speaking doctors and specialists worldwide. All divisions of the oil and gas industry in Latin America are covered with an international medical plan. Including; exploration and production, storage and transportation, refining, pipelines, booster stations and compressor stations. And don’t forget about Human Resources. Working in a large city or remote location, international medical can provide not only desperately needed medical care but also access to the best most qualified specialists and surgeons available. If adequate medical is not accessible, companies like Cigna Global will medi-vac you to a city, state or country that provides the quality care you need. Many hospitals in Latin America won’t even admit you in the event of an emergency unless you have either a high limit credit card or an international medical insurance ID card from a reputable insurance company. Domestic insurance is not looked upon favorably outside of the U.S. It simply doesn’t pay for enough services and reimbursement takes too long for it to be reliable international insurance. If you are new to a country or location, most likely you are unfamiliar with were to go for medical treatment, the language may be a barrier or there are simply no westernized facilities available. Experienced global medical insurance companies provide mobile applications to help locate doctors, view their profiles, fill prescriptions, schedule appointments, provide common medical term translations along with other useful information. Need help? You have phone access to advisors, translators and risk managers for mild concerns up to emergency situation. Access to experienced, professional help is at your fingertips. Evacuation / Repatriation … If an emergency strikes, our evacuation / repatriation policy ensures that your employees get transported to a facility that can handle their needs. Medical evacuation is a critical benefit, insuring your employee of dependent family member is transported to a facility that can properly care for their medical emergency. To a hospital nearby, to another country or back home for care. This optional benefit is payable at 100% and has no deductible. Medical coverage is required for this optional benefit. Call today for more information regarding long and short-term international medical coverage. 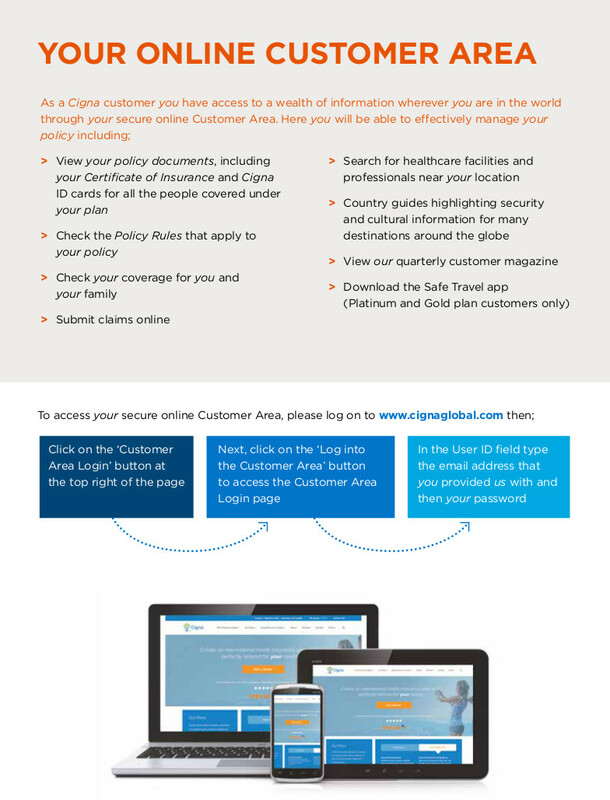 Cigna Global for anyone needing a Long-Term International Medical insurance policy for France. There are several requirement you need to be aware of to satisfy your Schengen visa. Travel and vacation visa’s are difficult to come by if you wish to stay longer than 90 days. But if your stay is for employment, the work visa will allow your long term work stay in France. If you’re planning on working for more than 90 days, you need to apply for a long-stay visa, which also acts as your residence permit. With the approved visa, family members can also accompany you during your long term stay. The EU Blue Card is for highly skilled workers. This is a one to three year work visa which can be renewable. After five years, you’re eligible for the renewable, 10-year, long-term EC residence card. Family members can get a private and family life residence permit, allowing them to work and after five years, they too are eligible for the long-term EC resident card. Along with other required documents needed to get a Schengen visa, all applicants have to present a medical insurance policy valid for the 27 European country Schengen territory. A letter from your insurance company is required. This letter has to mention that you will be covered in Europe for any medical, evacuation and repatriation expenses during your whole stay. Cigna Global and GeoBlue both meet the Schengen visa coverage requirements. The Cigna international medical coverage travels with you wherever you may be. While in France, your work assignment may take you to other European countries. Weekend trips outside of France or extended vacations anywhere worldwide. With Cigna, you’re covered! With access to 24/7/365 member help line, to assist you with an emergency, finding a doctor, locating a facility, or any other situation you may be in while outside of your home country. Search providers and request an appointment. Find medication availability, translate medical terms and phrases and use the audio feature to play translation as necessary. View your ID card and fax a copy directly to doctors to confirm eligibility. When your employees are outside the U.S., who do they call when a medical issue strikes? Their Human Resources (HR) department may not be available, the insurance company isn’t open at night or on weekends. What happens if the illness or injury occures on a Friday evening, does the employee need to wait until Monday to contact someone back home?. For information regarding an International Medical insurance plan, group or individual, please contact me anytime.